Get your music 4G fast with the new HTC One S, exclusively from T-Mobile. 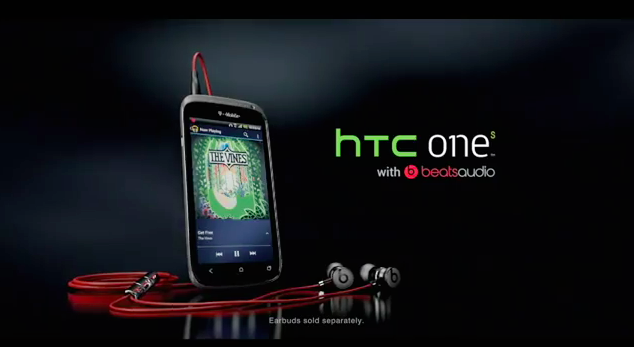 Combine the 4G speed of T-Mobile with the built-in beats audio technology of the new HTC One S 4G smartphone and what do you get? Stream your favorite songs from your music library straight from the cloud on Google Play. No wires. No syncing. Just 4G fast. ← Deutsche Telekom Looking To Purchase MetroPCS, Combine With T-Mobile USA? This is more like it. Showcase a device and its beneficial features and throw in Carly lookin’ good on the bike going 4G fast. Simple and to the point but now I’m thinking about T-mobile, the One S, and an awesome new(ish) Google service. Might take the long way home on my ZZR when I get off now. Someone once asked what direction T-Mobile should take. I feel this would be the appropriate one. Definitely, this is absolutely the route they need to be headed towards. I wouldn’t say the commercial is perfect because it REALLY doesn’t showcase the HTC One S to the best of its abilities, but its trending in the right direction. Leave the iPhone alone…all they’re doing is giving free publicity and advertising for Apple. Perfect……all except for the part where it kills motorcyclists! I’m pretty sure it’s illegal to listen to music on headphones on a motorcycle. Not sure why this got down voted… This is true, at least here in Florida. Whether it’s “illegal” or not……..it’s an UNSAFE practice. Don’t do it……..and, HTC/T-Mobile……..don’t encourage it!! You’re going to kill kids. anyone know the first song that she listens too before she changes to classic music really want to listen too it please let me know!!! I’m dying to know the name the song myself and I cannot find out anywhere! Listening to music with headphones while operating a motor vehicle is a dangerous (if not unlawful) activity. Whether or not it’s legal ANYWHERE…. it’s definitely unsafe EVERYWHERE. HTC and T-Mobile obviously failed to do the proper research before depicting this life-threatening practice. The fact that they’re promoting it using a young person on a speedy bike makes it all the more deplorable. (Come on, guys…give your own legal departments a call…..NOW! )There are already enough distractions on the open road capable of killing young drivers without adding one more ‘element’ to the mix. So, HTC and T-Mobile, I implore you to pull this spot! It’s irresponsible to say the least. False. I agree with you, however, I just wanted to point out that the real Michael Scott would not be this responsible, and would probably try to do magic tricks while riding a motorcycle. P.S. Bears. Beets. Battlestar Galactica.